The sea turtle is a living thing that usually lives in the sea, and lands when spawns. One of them, Loggerhead Sea Turtle is seen in Kochi Prefecture. Loggerhead Sea Turtle is a species of sea turtle. The scientific name of it is Caretta caretta and the Japanese name is Akaumigame. A large individual of them grows 100cm in the length of the shell and 180kg in weight, and they can live to an age of 80 years. The color of carapace is brown and plastron is pale yellow. Loggerhead Sea Turtle belongs to the superfamily Chelonioidea, and there are other 6 species. Loggerhead Sea Turtle is the only species that lay eggs in the temperate zone in sea turtles. In addition, their head is bigger than the others compared with their body. The habitat of Loggerhead Sea Turtle is a sea in the tropics to temperate zone. Young individuals live at the surface and adults live at the bottom. 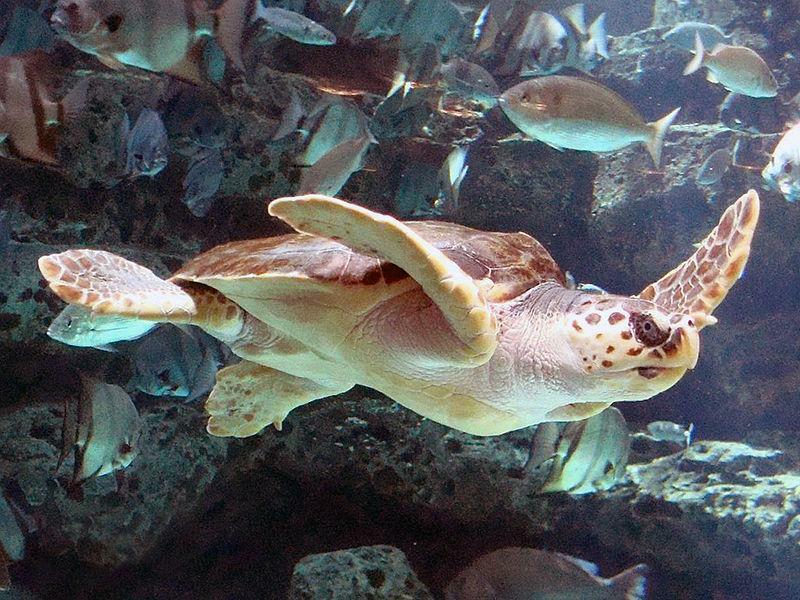 Loggerhead Sea Turtle is a polyphagia, but they mainly eat shellfish, crustacean and jellyfish. During spring to summer, they spawn at beaches. Then they lay about 100 to 150 eggs. About 70 days after, baby turtles the length of shell is 5cm and weight is 20g hatch. They require about 25 years to sexual maturation. Loggerhead Sea Turtle had been captured by man for food and mounting, and spawning grounds were destroyed. As a result, the number of them decreased. Therefore, they are specified for CITES 1. In Japan, they are listed in a Vulnerable and a natural monument. Moreover, people live in every place near turtles’ spawning ground are active to preserve them. Concretely, they clean beaches, move eggs to a place for safety, and remove tetrapods obstrructive to spawning. These actions became a tourism resource and an opportunity to have interest in conservation of nature. You can see some of them that are bred in aquariums. If you are lucky, you’ll encounter them in ocean. Occasionally, they appear at the beach of their spawning ground, but please don’t hamper them. I wish increase spawning ground. Why tey needs 25 years for sexual maturation?